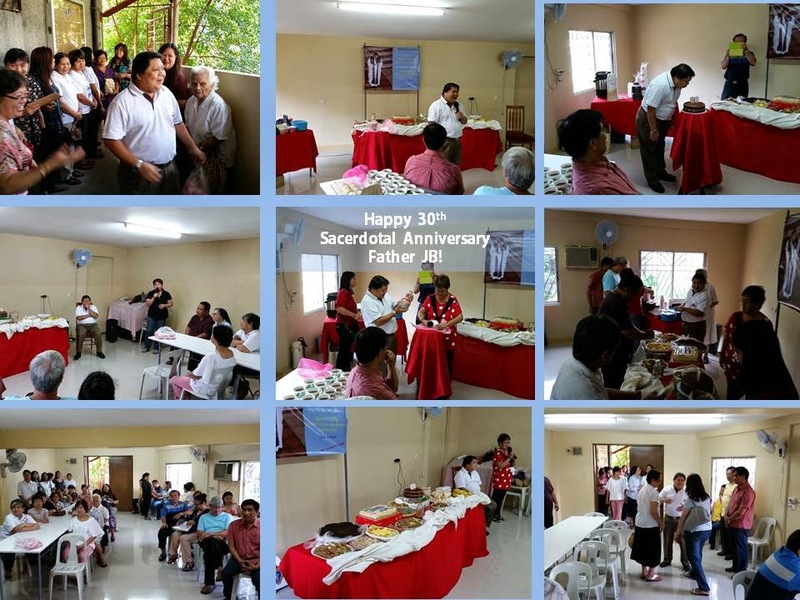 Last Friday, June 6, 2014, in a quiet but fitting celebration, our parish priest FJB was feted to a simple breakfast on the occasion of his Pearl anniversary as a priest. Parishioners, the PPC officers and well-wishers from the religious congregations, greeted him after the early morning mass. A short program was prepared in his honor. Ate Lina Feliciano offered a prayer in behalf of the parish for FJB’s continued commitment and general wellbeing. Then Ate Cora serenaded Father JB with two songs. Ate Josie Cruz led in the presentation of the birthday cake and the token gift of the parish. As a gift, FJB was presented with a special bottle filled with pink (FJB’s favorite color) sand and 29 white pearls. According to Ate Josie Cruz this is a lifetime gift to FJB. A special bag was also given which contained 6 blue pearls. FJB was asked to get one blue pearl and drop it into the bottle together with the rest of the 29 pearls. The 29 white pearls represent the 29 years of FJB’s service as an ordained priest. The blue pearl he dropped represents his first year as parish priest of SLRP. The 5 remaining blue pearls which he will drop yearly will, God willing, represent his remaining years here in SLRP. The bottle has enough room for more pearls for FJB to reach 100 years! 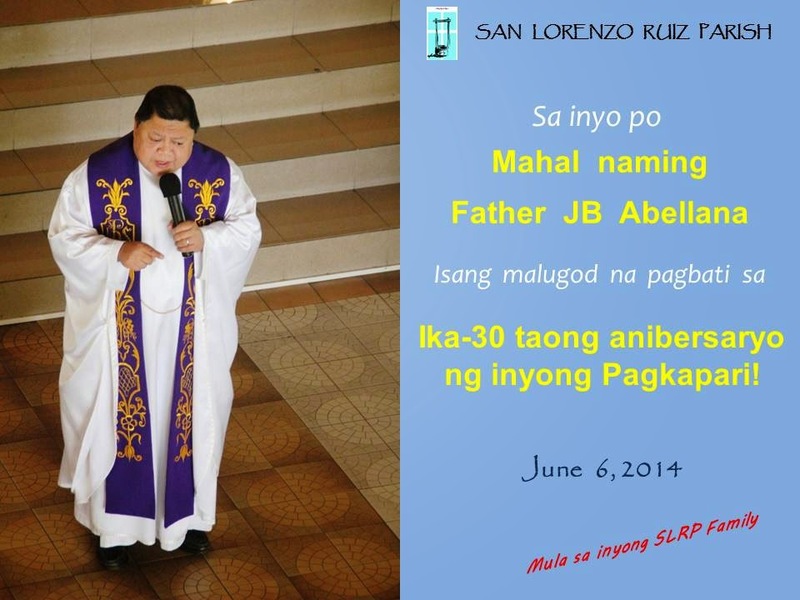 In his short message, FJB thanked the community of SLRP for remembering him on this special day. He further mentioned that it was his dream to be a priest and that SLRP is his dream parish. His wish is that the good Lord will allow him to continue with his chosen vocation until his last breath. This is the official website of our parish, located in G. Silang Street, Tierra Verde 1 Homes, Congressional Avenue Ext, Quezon City. It provides the parishioners and all those interested, a way of communicating information about our Patron Saint and the goings-on in the parish. What’s the truth Jesus comes to bear witness to in this last Gospel of the Church’s year? kings of the earth” (see 2 Samuel 7:12–16; Psalm 89:27–38). would “witness to the peoples” that God is renewing His “everlasting covenant” with David (see Isaiah 55:3–5). But as Jesus tells Pilate, there’s far more going on here than the restoration of a temporal monarchy. In the Revelation reading, Jesus calls Himself “the Alpha and the Omega,” the first and last letters of the Greek alphabet. He’s applying to Himself a description that God uses to describe Himself in the Old Testament—the first and the last, the One who calls forth all generations (see Isaiah 41:4; 44:6; 48:12). “He has made the world,” today’s Psalm cries, and His dominion is over all creation (see also John 1:3; Colossians 1:16–17). In the vision of Daniel we hear in today’s First Reading, He comes on “the clouds of heaven”—another sign of His divinity—to be given “glory and kingship” forever over all nations and peoples. Christ is King and His kingdom, while not of this world, exists in this world in the Church. We are a royal people. We know we have been loved by Him and freed by His blood and transformed into “a kingdom, priests for his God and Father” (see also Exodus 19:6; 1 Peter 2:9). As a priestly people, we share in His sacrifice and in His witness to God’s everlasting covenant. We belong to His truth and listen to His voice, waiting for Him to come again amid the clouds. SAN LORENZO RUIZ PARISH. Simple theme. Powered by Blogger.